Similarity is a useful program that helps you to find and remove similar, duplicate musical files (MP3, WMA, OGG, WAV, FLAC, APE, WV, MPC) with the same or similar sound content, music tags (ID3,WMF,Vorbis). Similarity is the best program where similarity of a sound part is checked, not just music tags or file content (byte to byte comparision). In addition Similarity program analyzes the artist, title, album information from the music tags. 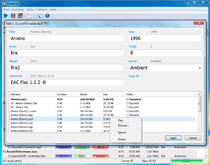 Similarity is a useful program that helps you to find and remove similar music. Similarity multilingual application with full Unicode support. Currently available languages are: English, French, German, Spanish, Russian, Czech, Bosnian, Estonian, Italian. Qweas is providing links to Similarity 1.3.7 as a courtesy, and makes no representations regarding Similarity or any other applications or any information related thereto. Any questions, complaints or claims regarding this application Similarity 1.3.7 must be directed to the appropriate software vendor. You may click the publisher link of Similarity on the top of this page to get more details about the vendor.